Look at your car’s owner’s manual for information on timing belt upkeep. Our ASE Certified technicians recommend suggest timing belt must be replaced at the manufacturer’s recommended distance and/or time periods. Failure to replace timing belt can result in complete breakdown or catastrophic engine failure. 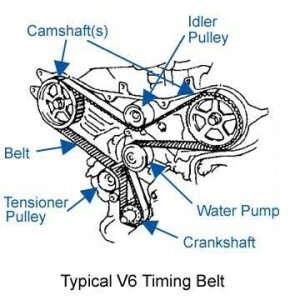 If the timing belt is not changed at the advised period, the belts could break, which may leave you stuck and possibly cause major engine damage. If you’re getting the timing belt replaced, consider changing other areas which may be accessed simultaneously. Water pump, timing belt sprockets, and tensioning pulleys are great good examples. Come in to Advantec Auto Repair and have one of our technicians do an inspection if you think your car needs a timing belt service.